The Sierra Madre Volunteer Firefighters’ Association will hold its annual Pancake Breakfast at the Fire Station from 7am to 11am. Cost is $5, and proceeds are used to help the SMVFA fund numerous philanthropic endeavors, including the recent Easter Egg Hunt, and the annual Christmas stocking giveaway on Christmas Eve. Friends of the Library will put on the 49th Annual Art Fair at Memorial Park from 9:30am to 6pm on Saturday (continues 9:30 to 5pm on Sunday). Admission to the Fair is free, and there will be live concerts by The String Planet from 11am to 1pm and The Eclectic Connection from 2pm to 4pm. Featured artist is Ivy Shuman, a wood turner from Chatsworth. The City of Sierra Madre and the General Plan Update Steering Committee (GPSC) is seeking input from the public at a Town Hall Forum to be held at the Sierra Madre Fire Station from 1 pm to 4 pm on Saturday, May 7th. The Fire Station is located at 242 W. Sierra Madre Blvd. This forum is a community wide brain storming session to help determine the vision to carry Sierra Madre into the next 20-30 years. The focus of this forum is Families, Youth, Businesses, Services, and Institutions. Sierra Madre Kiwanis will host the Boot-Skootin Dance and Chili Cook-off Fundraiser from 6 to 10pm at the Sierra Madre Room in the Rec. 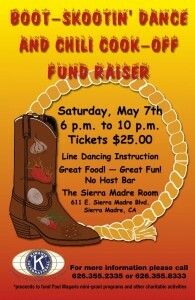 Center at 611 E. Sierra Madre Blvd.. Tickets are $25, and include samples of the Chili Cook-off entries and line dance instruction. There will be a no-host bar. Proceeds will be used to help fund the Paul Magaris Mini-Grant program and other charitable activities. For more information, call 355-2335 or 355-8333.